New month, new promos! We reckon that after our March and April promotions, you’re feeling pretty ready for this next list of five ways to make more money in May. April showers bring May flowers, but springtime blooms aren’t the only green we want you to be seeing this May – we also want you to make some bucks off of your Artist Shop. 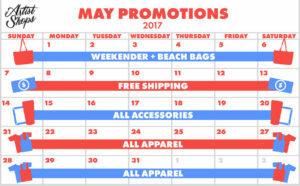 The rules for the May promos are the same: all this month, we’ll be challenging you to promote a specific product or deal each week. If you sell a product from your Artist Shop during the week we’re promoting it, you earn an extra dollar for every sale made! Quick refresher: this month when you sell a certain item during the week it’s being promoted, you’ll make an extra dollar on that sale! For example, during the week of May 14th, you’ll earn an extra $1 on every accessory you sell. This also means that if you order products for yourself from your shop, you also save a dollar when you order the product being promoted that week! We recommend ordering items ahead of their promotion week so you have ample time to take some photos to promote those specific products on social media (and you always only pay the base cost). Every great weekend getaway starts with with a great weekender or beach bag to pack your life into! And with the new rope-handle beach tote launching (coming soon, stay tuned!) it’ll be the perfect way to promote a brand new product right when people are getting ready for beach season. Tip: create a packing guide for the ultimate vacation or staycation, and take photos of your weekender and beach bags holding other products you sell – may we suggest beach towels? And with Mother’s Day just around the corner, this is a good time to nudge gift-buyers into getting their mom something special from your shop! Everyone loves free shipping! It can mean the difference between somebody considering buying something and actually pressing the “BUY NOW” button. And with the little “Free Shipping Code!” banner that will appear at the top of your shop, people won’t be able to miss it. So your goal this week is to promote free shipping and your shop to get as many people to check it out and see that sweet free shipping banner as you can! Tip: this is a great time to promote your best-selling designs and to really milk that “guilt-free” aspect of splurging while getting free shipping! Also, appeal to those super last-minute Mother’s Day shoppers on social media! Yeah, that’s right: all accessories! With accessories like mugs, notebooks, and phone cases freshly dropping just a few months ago, this is a great time to push these products (or to add them if you haven’t already!) Tip: In many areas, summer is just around the corner – the perfect time to do a travel-in-style guide with travel mugs, towels, and totes. Or, appeal to artists by showing off how different sized pouches, notebooks, and totes from your shop can go together for the perfect artist’s accessory arsenal. Finally, consider posting pictures of cool drawings or hand lettering in a notebook of your own creation. For two weeks straight it doesn’t matter whether a customer prefers tanks to triblend tees – promote it all! This is your chance to get clever with how you show off your apparel goods. Tip: create a full style guide featuring ALL of your styles! It’s also prime time to feature any customer photos (even if those customer photos are ones you requested your friends and family post). Offer Free Shipping to Your Customers!